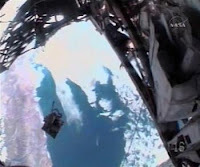 On November 18th, 2008, NASA astronaut Heidemarie Stefanyshyn-Piper was out on a spacewalk to repair a joint on one of the stations solar panels. Along with her, she carried a tool bag with the implements she would need to fix the joint. One of these tools was a grease gun. For some unknown reason, the grease gun exploded, covering Stefanyshyn-Piper and one of her cameras in the gray goo. While attempting to clean off some of the grease, the bag slipped out of her grasp, seemingly lost forever to space. This tool bag, about the size of a backpack, is one of the largest objects ever lost in space. The bag is not lost forever, though. You can see the bag as it speeds over your town! To find what time and where to look for NASA's tool bag, check out SpaceWeather's Satellite Tracker. Just enter your ZIP code and it will tell you when to look for the ISS and the tool bag, among other satellites. Problem is, the tool bag is quite dim, around 6th magnitude, so it might not be visible from light-polluted neighborhoods without the aid of a telescope. Amateur astronomer Kevin Fetter of Brockville, Ontario has already caught a video of the speeding bag. Find the video here (900 kb). That video is incredible, and the photographer did a awesome job. Wow, that's the kind of thing that puts our relative speed in the solar system into sharp perspective. Thanks for posting this, Sean. I'll have to see if it's going to burn up in the atmosphere. That could be interesting to see, too.